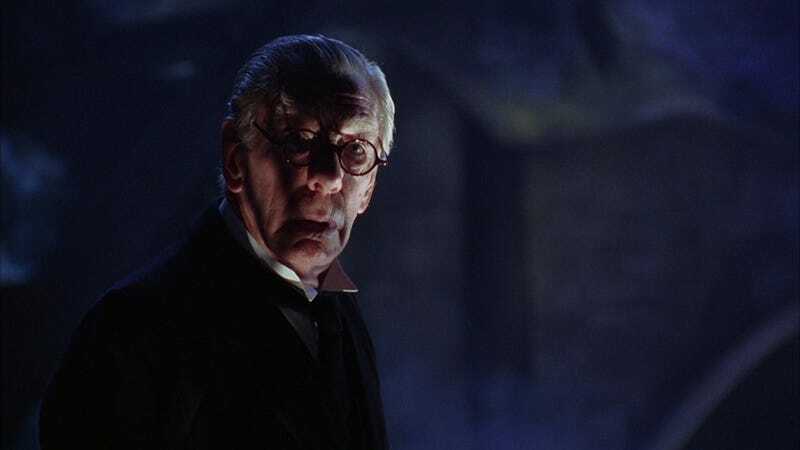 Michael Gough, who died today, was one of those actors who's been in a ton of amazing stuff — after a while, you start to see him everywhere, giving amazing performances. Gough was an indispensible part of four Batman movies, playing Bruce Wayne's butler and advisor, Alfred Pennyworth. In fact, he was the only point of continuity between the two Tim Burton films and the Joel Schumacher sequels. He lent a certain gravity and seriousness to any scene he was in, even when he was presiding over a squabble between George Clooney's Batman and Chris O'Donnell's Robin. He also appeared in other Burton films, Sleepy Hollow, Corpse Bride and Alice in Wonderland. And he was a mainstay in British horror films, playing opposite Christopher Lee and other classic Hammer actors in films like Dracula, The Phantom of the Opera, Horrors of the Black Museum, The Corpse and Satan's Slave. But he also played a host of other classic science fiction roles in his long career. He was Dr. Armstrong, the roboticist, in the Avengers episode "The Cybernauts." He was in one episode of Blake's 7, "Volcano." He was in the Ealing classic The Man in the White Suit, about an inventor who creates a fabric that never wears out. And his final role: voicing the Parasite in the direct-to-DVD All-Star Superman. Gough was one of genre television and film's most unforgettable supporting actors, as well as a great villain on occasion. He'll be sorely missed.